Have a look at the video below and pay close attention to how Rickey is walking. That’s not a limp caused by a sore leg. To a vet, that’s an emergency. If your dog ever starts walking like this, especially after a jump or fall, keep them very still and see a vet immediately. Their life may depend on it. Rickey is ataxic. That means he’s lost some control over how his legs are moving, and it’s a hallmark of neurological disease. Something is interfering with his nervous system’s ability to move his legs. Intervertebral disks are the flexible pads that sit between the spinal vertebral bones in the back. They act both as joints and cushions, and are yet another marvel of nature. IVDD is when the disk fails, and although it’s often called a ‘slipped disk’, that’s not really what happens in dogs. Rickey’s disk didn’t slip, it burst after he jumped off a chair. In Type I IVDD, the disk itself degenerates and the ring of fibres that holds it together weakens. Eventually it gets weak enough that a sudden compressive force, usually from jumping off furniture, causes the outer fibres to split and the inner disk content to be violently expelled. The bad news is that when it ruptures, contents of the disk often travel towards the spinal cord. That’s Rickey’s xrays showing which disk is the likely culprit. You can see that the spinal canal containing the cord runs just above the disk. What we can’t see on the xray is that some of that disk material is now pressing on the spinal cord hard enough to stop the flow of nerve signals. What all these breeds have in common is a genetic defect called chondrodystrophy. The same thing that causes their cute body shape also causes premature degeneration of intervertebral discs. IVDD is always more common in overweight dogs of these breeds. In our clinic, we observe that IVDD also occurs in very excitable and energetic dogs of any breed. This may explain an increased prevalence observed in male dogs. There is a higher risk in desexed (neutered) females that could be explained by increased weight. Rickey was lucky; his cord injury was only partial, his owner brought him straight down and he responded well to treatment. All three of these factors can easily go the other way. If a dog has lost all voluntary movement and pain sensation to the hind legs, there’s still a chance that rapid surgical decompression can save them. However, if paralysis can’t be reversed there’s not much hope for quality of life. I know from bitter experience that no matter what people say about how good their dog is on a cart, the reality of their life is very different. Visit this page for non-neurological causes of lameness in dogs. 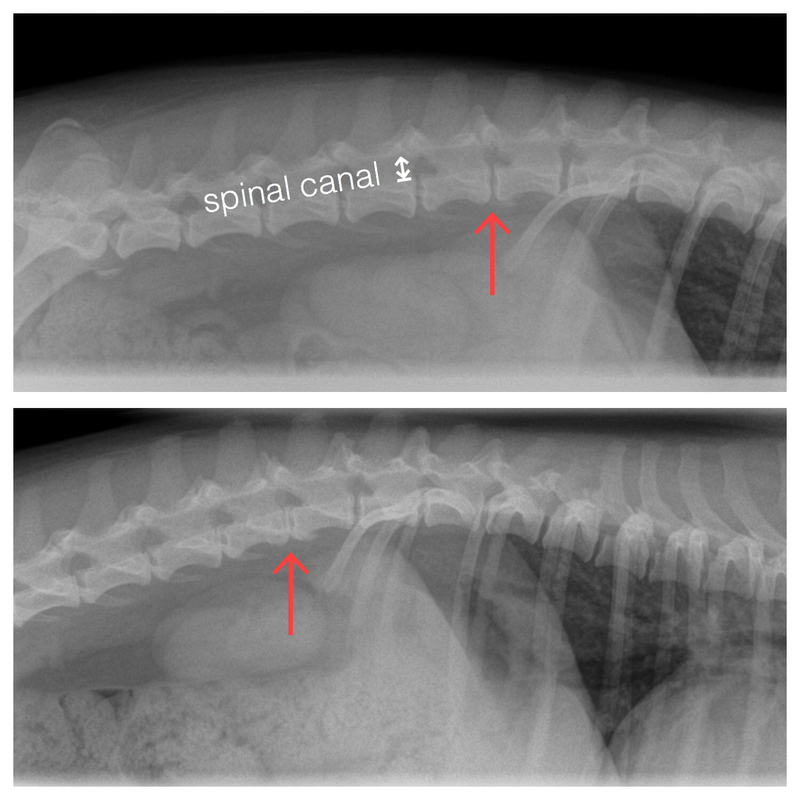 Dogs with IVDD often have back pain at the time of the spinal injury, shown by arching of the back, shivering and lethargy. It’s especially important to be aware of signs of the disease in susceptible breeds such as the Dachshund, Beagle, Shih Tzu, Lhasa Apso or Pekingese. Sometimes the main problem is pain from nerve root compression, not neurological dysfunction. Confirmation of the diagnosis is only possible with advanced imaging such as CT scans or MRI. However, in most cases the combination of the history and examination plus plain x-rays are enough for vets to be confident. X-rays such as Rickey’s often show a narrow disk space and/or calcified disk material visible in the spinal canal. For dogs with mild to moderate signs, and no further worsening, conservative treatment is often very successful. However, I have personally seen too many dogs get worse with poorly managed conservative treatment. The theory behind cage rest is that if the dog is kept extremely still, the disk material will stop moving and the body is able to wall off and repair the damage. Dogs must be confined in a cage that is only just big enough to fit their bed plus food and water. The only times a dog should be allowed out of the cage for at least the first two weeks is while being held to go to the toilet. Yes, it sounds cruel, but if the dog is near the owner, they are usually happy enough. The consequences of failure are just too serious to take chances. A vital part of conservative treatment is close monitoring by the owner and vet, with the readiness to change course quickly if necessary. Surgical referral is best if a dog is severely affected, has repeated episodes, or fails to respond to conservative treatment. The option of referral is always available even in milder cases even if only for a second opinion and advanced imaging. Rickey’s case was successful for more than one reason. When his owner rang for a Saturday appointment, we were already booked to 5:30pm and the nurse, to her credit, didn’t hesitate to slot him in, even though it was ‘only a leg problem’. Who could have guessed over the phone how much danger Rickey was in? Hi Hugo. I’m sorry to hear about your dog and I’m happy to view the video. If you post it on social media or YouTube please send a reply with the link. However, I’m afraid that a video alone isn’t going to provide a diagnosis. My best advice is to find a veterinary specialist in your area (this is our local list http://www.walkervillevet.com.au/blog/list-adelaide-vet-specialists/). The easiest way will be to ask your vets for a referral, which they will do happily.